i did not checked for 42.2 and 42.3 default installation. i guess this works. 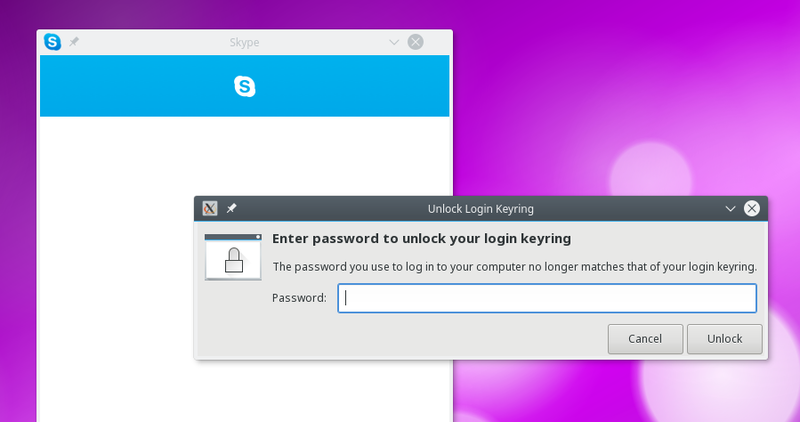 some apps as skype uses gnome keyring then when you install it then it installs also gnome keyring. + Added possibility to change border width of ComboBox widget. + Added missing utmp/wtmp/btmp handling. + Make greeter see icons set by AccountsServices. - Fix sddm.conf man page syntax error and update. - Fix connection of PropertiesChanged event for LogindSeat. - Avoid race conditions with Xsetup. * Adjust order of components in the default PATH. * Set default input method to qtvirtualkeyboard. + Support non-latin characters in theme settings. + Support fish shell in Xsession and wayland-session. - Make the default cursor themed. - Update date and time in elarun theme. - Fix theme metadata default values. - Fix session selection in elarun. - Do not truncate XAUTHORITY on login. - Make enabled property of Button functional. * Add ConsoleKit 2 support. * Stop assuming shadow(5) is always available. * Explicitely set XDG_SEAT when starting a user session. * Suppress errors when pam_elogind is not available. * Suppress errors when pam_systemd is not available. * Added possibility to change color of dropdown menu. ... must be some other reason??? I have had that happen with Ubuntu. It was because I had changed my login password at some time. So I just entered the previous password there. That opened the keyring and reset the keyring password so that this didn't happen again. However, I was logged into Gnome at the time. I don't know what happens if logged into KDE when this occurs. yes i get this problem. hypothesis : slow answer from gnome keyring for autocompleting id and pwd when skype starts because baloo indexing does many disk accesses when opening a kde session. in the past i get this problem with hangouts and kwallet. there is not much to do. to minimize disk accesses perhaps don't get new mails and akregator rss news during opening kde session for example. also signal this problem to skype support : help > assistance or help > signal a problem.